In connection with the recent release of my book, MORE DEADLY THAN WAR (May 2018), I am offering free virtual visits to classrooms, subject to my availability. These Skype sessions will focus on World War I— why it was fought, how it shaped world history, and why it is relevant today. But I will also explore some hidden history from my new book: how the war was intricately intertwined with the Spanish Flu pandemic that killed an estimated 100 million people worldwide in the space of a year and ranks as the deadliest outbreak of disease in modern history. Please use the CONTACT page on this website or send a brief email to [email protected] if you would like to be considered for a free Skype session. Include the name of your school, location, class size and the grade level of your students. Multiple classes are welcome. I hope you will join me in this Teach-In opportunity. I look forward to hearing from you. 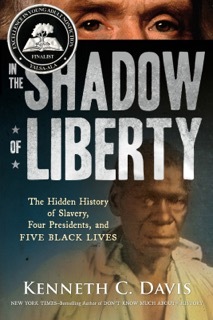 Also my recent book, In the Shadow of Liberty: The Hidden History of Slavery, Four Presidents, and Five Black Lives is now available in paperback. In it, I tell the stories of five people who were enslaved by four American presidents — Washington, Jefferson, Madison, and Jackson. BILLY LEE, who became George Washington’s valet and fought in the American Revolution alongside him. ONA JUDGE, who escaped from Washington’s Philadelphia home—only to be tracked down by the president’s men. ISAAC GRANGER, who survived the devastation of Yorktown before returning to Thomas Jefferson’s Monticello. PAUL JENNINGS, who was present at the burning of James Madison’s White House during the War of 1812. ALFRED JACKSON, who was born into slavery at Andrew Jackson’s Hermitage, survived the Civil War, and lived at the plantation into the 20th century. Since publication last year, the book has received a number of awards and honors. •A FINALIST for 2017 Award for Excellence in Young Adult Nonfiction by YALSA — the Young Adult Library Services Association of the American Library Association. More comments and information about this book can be found on this website.